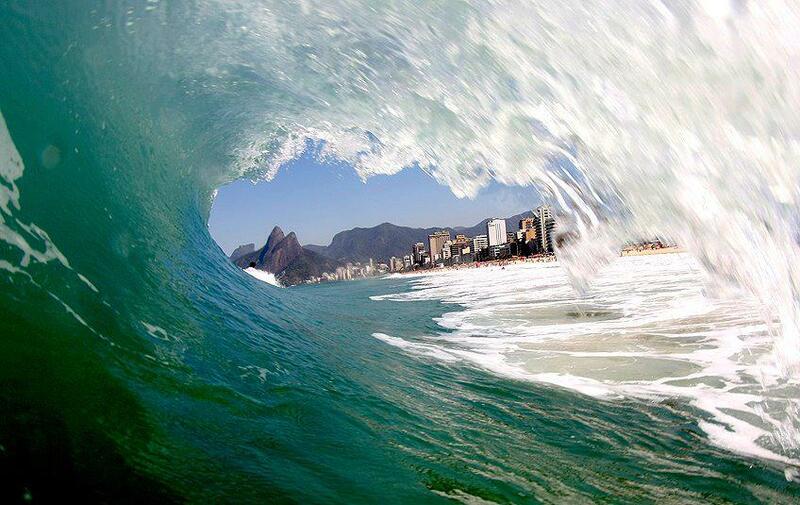 Rio de Janeiro is, among other things, a surfing town. Don’t underestimate this statement: Rio has produced several world champions and Brazil is considered on of the world’s strengths in the sport. It all began in Ipanema in the sixties and the seventies. Although before surfing was imported from the USA by American expats there were other more indigenous forms of riding waves. Catching crocodiles, pegar Jacare, means riding waves without the help of a board and it never fell into the same category as surf or body surf. As it did not have any expensive accessories attached to it, there were no commercial interests in promoting it so it never has been considered cool, although back in the day it was “the” way to affirm one’s masculinity on days with high waves. Nowadays there are many surfers from the favelas, but when surf arrived in Rio the rudimentary sport was a substitute for those who couldn’t afford a board. In some cases it went beyond the economic limitations: it was the best way to feel the power of nature on the body and to test one’s courage in the water. When the red flags were up there would be always some crazy guys who went out there and, as the photographer of the picture above, they held everyone’s breath on the crowded sand. Some unaware tourists could try to join them and but not knowing the secrets of the currents and of the waves they would end up giving work to the life guards. From those days crocodile catchers share with Rio’s surfers the glory of ruling Rio’s waves.